Selecting the right financial advisor for you is one of the most important financial decisions you will make in your lifetime. Interviewing and hiring the right financial advisor who is a good match for your needs is possible if you ask the right questions. Your job is to secure forthright answers to these questions without the typical marketing hype. 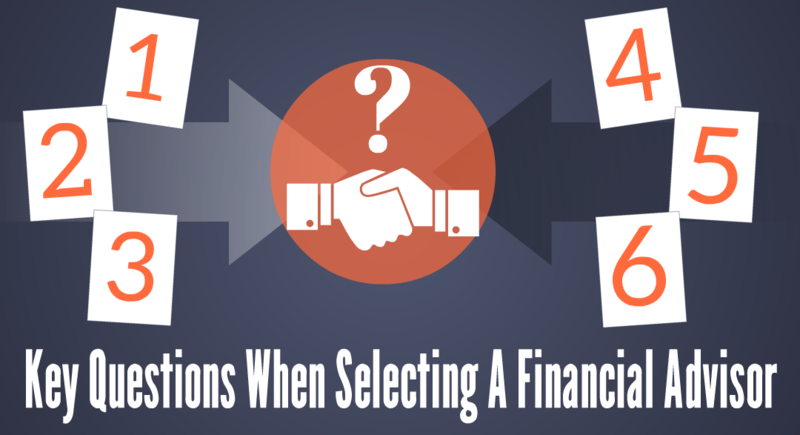 Taken together with your personal concerns these six sets of questions are a very good starting point to help determine if a particular financial advisor is the right match for you. Has the financial advisor ever been the subject of client complaints or disciplinary action by government regulators? One of the biggest fears for investors is losing money through fraud or being bilked by dishonest brokers or advisors.There are resources that can help prevent you from being victimized by unscrupulous individuals. The Financial Industry Regulatory Authority (FINRA) is the financial industry’s watchdog. One of their trusted tools for investors is the website https://brokercheck.finra.org/. This site shows you the employment history, licenses and records of complaints and disciplinary violations of brokers and advisors. This valuable information will help guard you against unethical industry behavior and keep you safer. Is the financial advisor a fee-only advisor or do they receive commissions from recommended investments? Commision based compensation arrangements can present potential conflicts of interest and should be avoided. Can you ever be sure of the advisors intentions when commissions are involved? Fee-only agreements eliminate those conflicts of interest between you and your financial advisor. In fact, a fee-only advisor’s priority is to minimize commissions and expenses in order to improve your performance. A fee-only advisor relationship insures your interests are most closely aligned and helps eliminate potential conflicts of interest. This is where you should match your key criteria, the relationship elements most important to you, with the philosophy of the advisor. Do the advisor’s values, principles and ideology match yours? Does their philosophy help answer your personal concerns and questions and give you confidence they can meet your financial objectives? For example, if you are nearing retirement and protection of your valuable nest egg is your top priority, you should look to partner with a financial advisor with a conservative philosophy. The key question you must answer is, does the financial advisor have a well-defined philosophy that addresses your most important needs? Does the financial advisor’s investment strategy thoroughly emphasize the importance of handling risk and how exactly will risk be managed? All investing involves some degree of risk but there are ways to lessen the hazard. Does the advisor have a well-articulated plan to protect your wealth through the inevitable bear market periods? The first principle of successful investing is not to lose big so that compounding your wealth is more easily achieved. Is the strategy an “active” or “passive” approach? Generally, the “passive” strategy adheres to a fixed asset allocation regardless of changing economic or financial market conditions. This approach does leave investors fully exposed during painful bear markets and that can be emotionally challenging, especially for retirees without time to earn any losses back. We believe the “active” approach is best defined as meaning active risk management to smooth out the ride that can often get bumpy. Learn more about the two competing strategies here: Active vs. Passive Investment Strategies: Which is Right for You? Is their performance history documented and does it adhere to Global Investment Performance Standards (GIPS)? A documented performance history offers transparency and separates real client results from fabricated marketing hype or claims. GIPS is the investment industry’s gold standard of authentication used to measure investment performance. GIPS is an invaluable tool to easily compare investment managers on an “apples to apples” basis. Composite performance reports average the returns of all client portfolios with similar financial objectives. Be sure to ask if a third party provider builds the performance report and oversees the advisory firm to insure it is in full compliance with strict GIPS standards. Authenticating performance brings higher confidence to your financial advisor decision. What is the financial advisor’s performance history? This is a most important question and requires evaluation from several different perspectives. Investment brokers will not likely have a composite history of client performance making it very difficult to adequately assess past results. Registered financial advisors should provide their comprehensive long-term performance history and preferably claim compliance with GIPS standards. Ideally, you should examine 10 years or more of historical data and gauge annualized results through both good and bad market environments. “How have you performed?” is only half the question! “How much risk did you take to generate that return?” is an equally important topic which we address next. How much risk was taken and how has risk been quantified? One of the best ways to judge risk-adjusted returns is to examine how well an advisor handles the inevitable difficult market periods. Since 2000, the stock market has experienced two vicious declines of greater than 50%, providing an excellent benchmark to gauge risk-adjusted performance. How did the strategy perform during those bear market periods? The GIPS performance report can provide measures of portfolio volatility, for instance beta and standard deviation, and compare them to various indexes. These can help you evaluate and better understand just how volatile the investment strategy has been compared to widely followed benchmarks. What are the financial advisor’s worst percentage drawdowns during the bad periods? A drawdown is the measurement of top to bottom percentage decline in portfolio values. Percentage drawdown can indicate whether or not the advisor employs proper risk management disciplines. One helpful exercise is to study the advisor’s drawdown history and determine how much of a portfolio decline you could stomach. In other words, if you had a $1,000,000 portfolio at what point would you have seriously reconsidered whether it was prudent to continue with the strategy? When the portfolio drops to $900,000 or $800,000, or $700,000 or even lower–just when would your personal comfort level have been breached? This is an especially important question for retirees to answer since it is virtually impossible to maintain your standard of living if your nest egg ever suffers significant market losses. We provide this performance documentation directly on our company website, because we believe it is far better for our potential new clients to know the answer to this drawdown question before committing their nest egg to our financial plan. This exercise is a valuable reality-check that will raise your confidence and allow you to sleep a whole lot better at night. By making the effort to fully work through this evaluation process you can have confidence in partnering with an advisor that matches your objectives and answers all your concerns. The end result of getting answers to these key questions will bring that confidence to the decision process and help you become a better client. The time spent today will bring you years of comfort and peace of mind on your financial journey. Disclaimer: Pring Turner is a Financial Advisor headquartered in Walnut Creek, Ca and is registered with the Securities and Exchange Commission under the Investment Advisers Act of 1940. The views represented herein are Pring Turner’s own and all information is obtained from sources believed to be accurate and reliable. This information should not be considered a solicitation or offer to provide any service in any jurisdiction where it would be unlawful to do so. Past performance does not guarantee future results.